On average, hotels use 5 to 10 gallons of water per room daily for laundry use. The laundry is an important factor in helping to maintain a clean and accommodating environment for guests at the hotel. 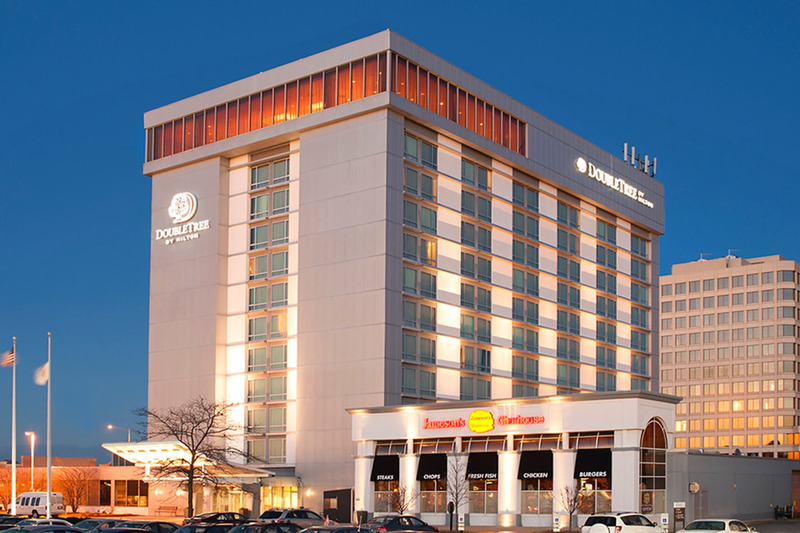 An existing domestic hot water generator servicing the laundry equipment at the Double Tree Hotel in Skokie, Ill., was in need of repair. Contractor, First Point Mechanical called on Metropolitan Industries and upon reviewing the conditions of the heat exchanger, Metropolitan recommended that a new system be purchased and installed. 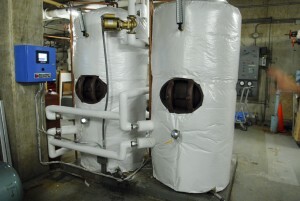 The existing hot water generator was used exclusively for domestic hot water for the hotel laundry washers. It was important that the system be replaced and in a timely fashion. The previous system featured a large singular storage tank with an integral tube bundle. 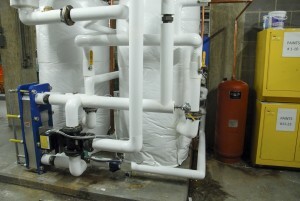 Boiler water would circulate through the tubes in the tube bundle to heat the water in the storage tank as required. Metropolitan designed and selected new equipment including the controls for the project. The control for the new system is what allows the system to operate properly. The system’s program is customized through ThermoTech controller. By, utilizing RTD as a set point to turn on and off the new boilers, the system maintains non-potable hydronic boiler water to generate potable domestic hot water for the laundry. The goal of the new customized system is to circulate domestic water through the heat exchanger in order to maintain temperature. As opposed to being out of the box, this system’s equipment is completely customized with the pump, control valve and controls in order to get the best results. Metropolitan recommended utilizing two smaller storage tanks with an external plate and frame heat exchanger to provide the heat transfer for generating the domestic hot water. This new system includes a 3-Way diverting valve and custom programmed ThermoTech controller to maintain the desired temperature set point of the hot water system. Metropolitan’s ThermoTech controller is a customizable menu-configurable temperature management controller operated through a color touch screen, which enables precise management of a multitude of temperature based processes. Two smaller storage tanks provide the heat transfer for generating the hot water more efficiently. ThermoTech can be programmed to perform a vast number of functions, enabling optimization of the thermal application or process being managed. The controller is completely customizable to meet the requirements of each system’s specifications. Due to the space restrictions on bringing new equipment down to the mechanical room the equipment was shipped loose for piping and wiring completed in the field. The system is designed for heating 20 gpm of domestic water from 40 oF to 160 oF utilizing 120 gpm of hydronic boiler water. Hydronic boiler water providing a 20 oF delta “T” (180 oF to 160 oF).